2. College of the Voice, a placeholder model. 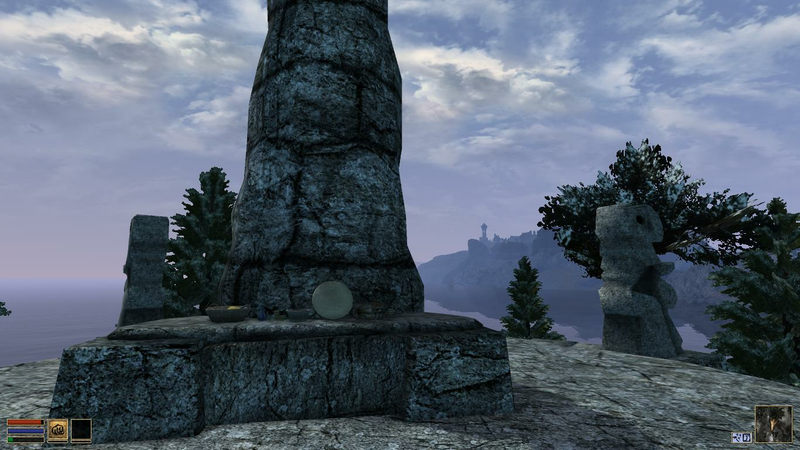 A Vivec statue in front of it, to be replaced with a Tiber Septim statue. 3. Hall of Imperial guilds, MG and FG guild halls are located here. 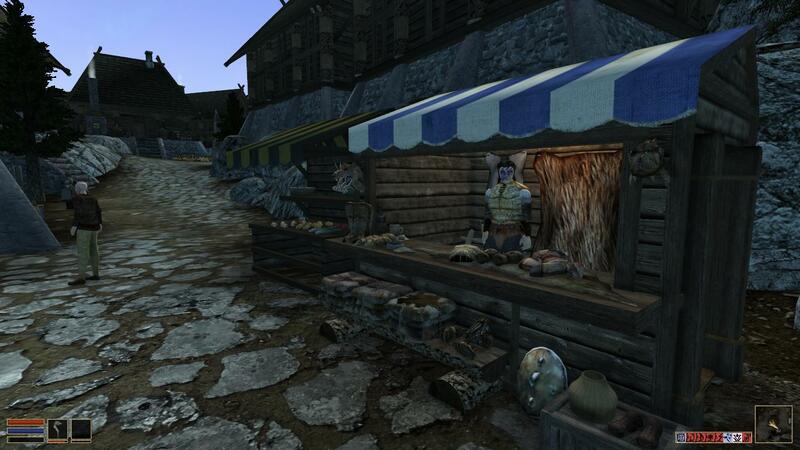 I thought about putting a merchants' guild here as well. 5. 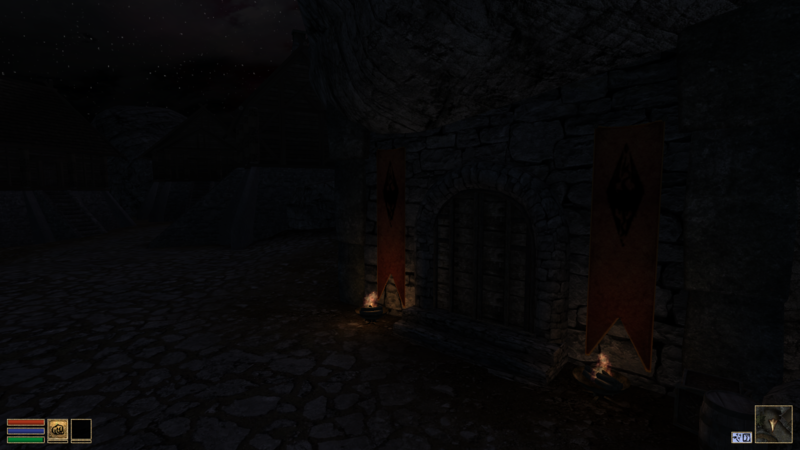 Imperial tavern, "The Moth And The Flame"
I'm not sure, if I'd be able to create a proper Tiber Septim Statue for the front area. A worty statue isn't a trivial task, unless you go the cheap route of baking an npc model in a certain pose... Something I wouldn't want to do. I'd want to match Infragris' statues in quality. 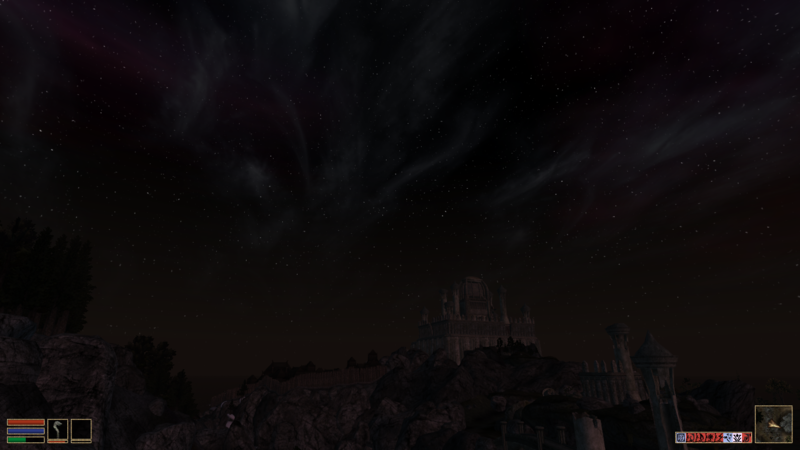 Looking nice, roerich. 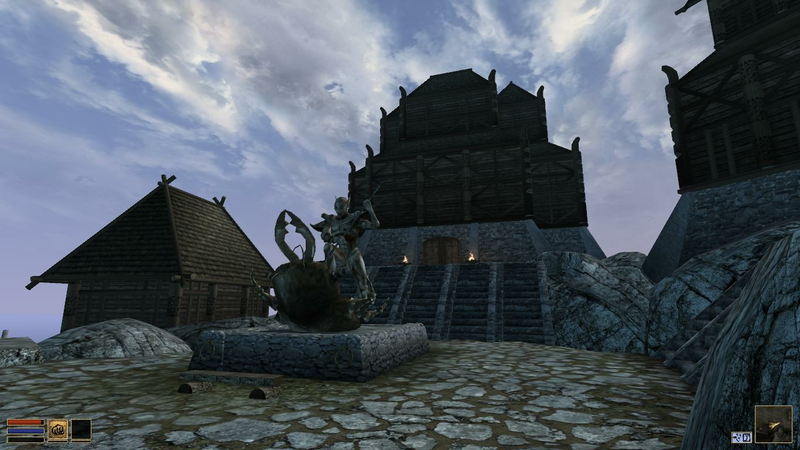 Are you in the process of rearranging the courtyard buildings in front of Elfstone keep? 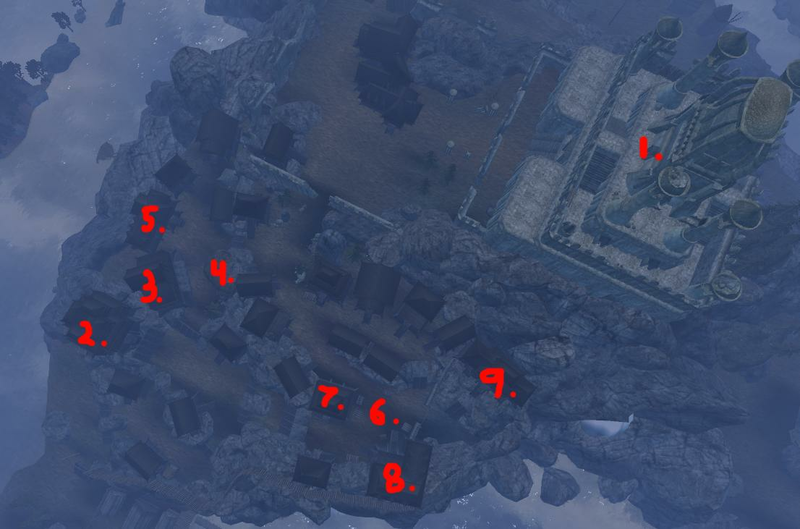 There should be at least one clanstead in Markarth, though #9 might best be used for a Nord temple. Now that's a nice college. But it is missing the beam circled here? I'm not quite sure I understand the practicality of the hollowed-out wooden superstructure, if most of the actual building is underground. It does look neat, though. Very original design. The superstructure is supposed to catch sound. It might have helped the original students to transport themselves back to the college via a shout more easily. It could also act as some kind of stage or arena. 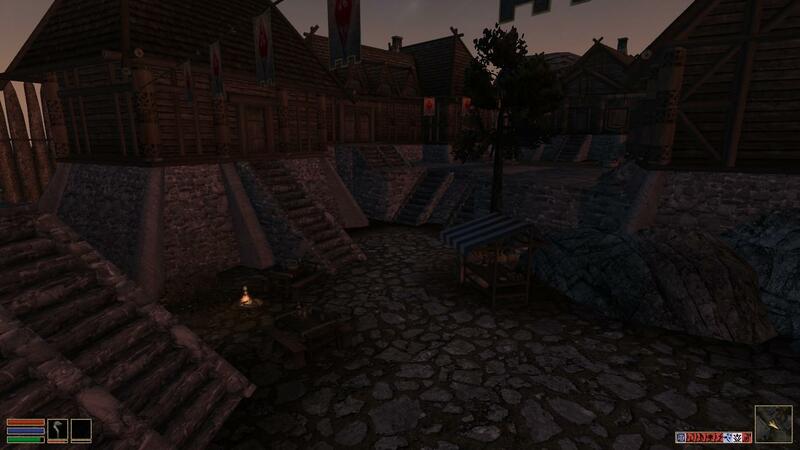 Yes the courtyard area will be reworked almost completely, to fit the rest of the city better. Woah that is wicked cool worsas, though I was a bit confused about it as well. 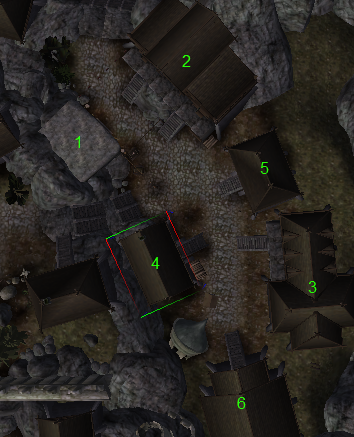 Perhaps make the "basement" part of the structure bigger? And still made out of stone of course, even the most sturdy woodwork would stand little chance against prolonged shouting. I hope we can bribe Infragris to make a Tiber statue.. Somehow. I have a perfect design in my mind. Edit: If you want to, can you upload that WIP structure file for me? So I can modify the surrounding area to fit it. I'm still going to tweak the building a little bit. I'm glad you like it so far. A bit deviating from your proposal, but I hope you are fine with it. Terrific. But it will be quite extensive underground then. As you can see I've added a significant Imperial Quarter. 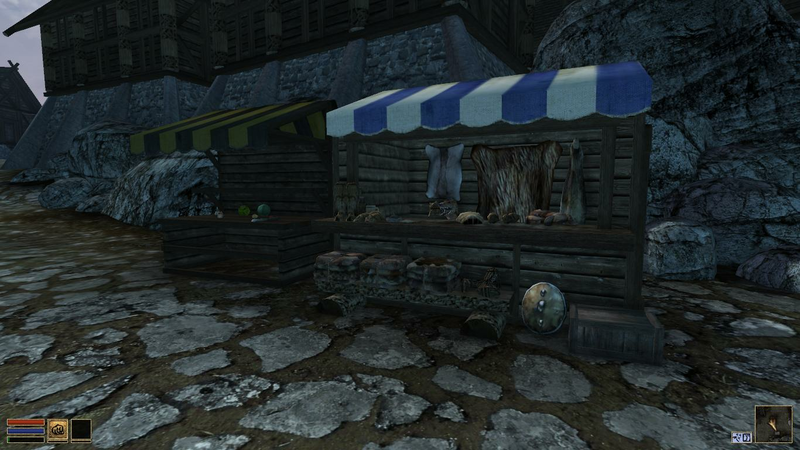 It's existance is a consequence of the past of the CotV (as outlined in the CotV-thread), where Markarth saw a large number of Imperial visitors, some of whom decided to stay as citizens, opening up shops and taverns to accomodate the Imperial population. 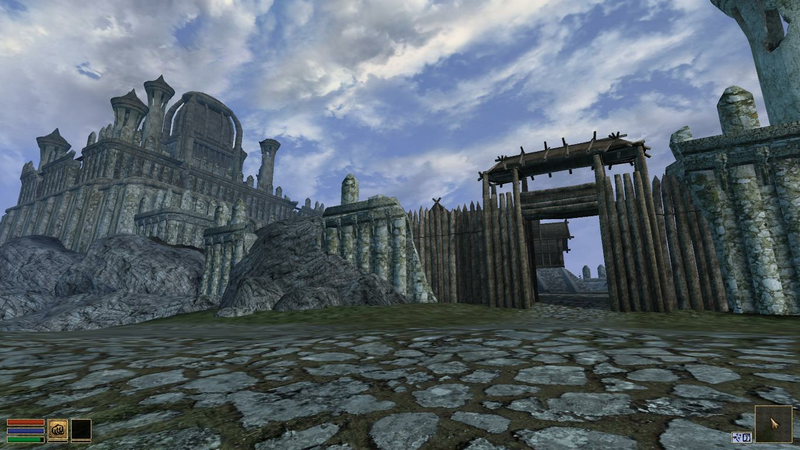 The Imperial Quarter deteriorated in tact with the college, but has recently seen an influx of Imperials from Haafinheim; displaced Imperial citizens and officials from fiefs annexed by King Thian, welcomed by King Barda. 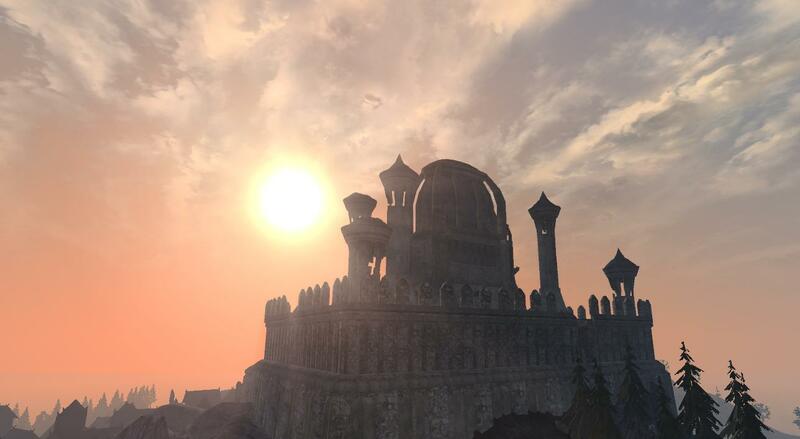 The Imperial Quarter is currently more about Imperial guilds like the FG and MG as well as trade between The Reach and Cyrodiil, as well as the general Imperial population that has been present for many centuries. 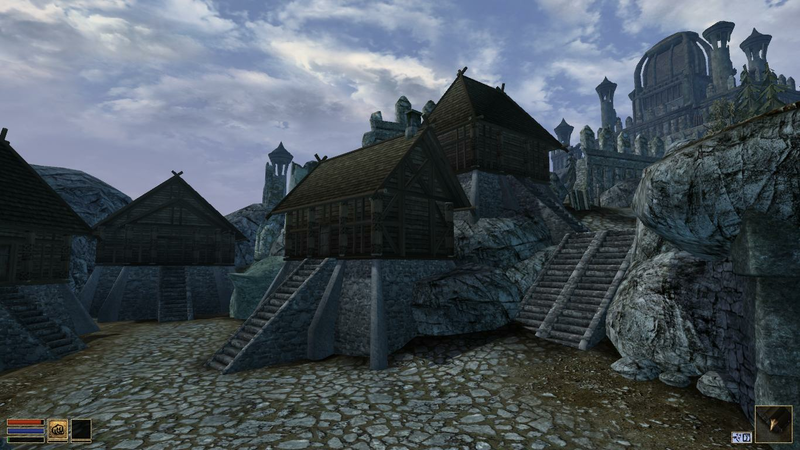 I really like what you are doing here, how Markarth looks like a town, with it's districts easily distinguishable and having sense planning-wise. Markart architecture set is pretty clever too, it helps achieving that crowded atmosphere a lot. I like new College building too, it's something unique and yet doesn't feel out of place. 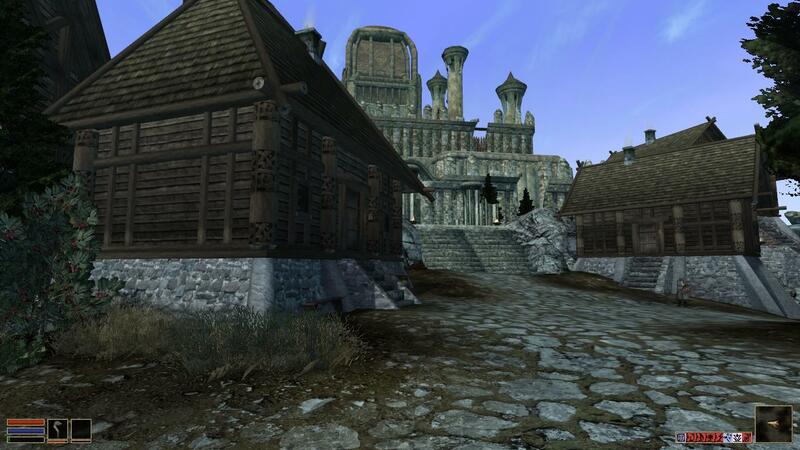 I am fond of the Imperial Quarter, I enjoyed taking CS walk through it yesterday. 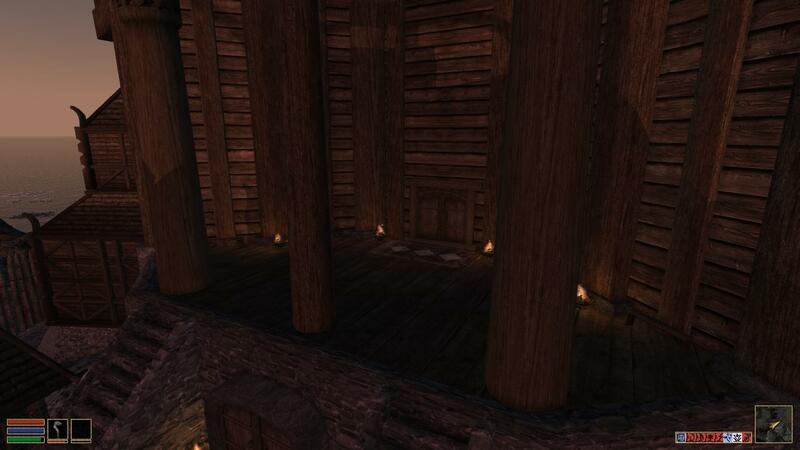 I think it could be made to be player's safe haven in unwelcoming Reach? It already looks quite comforting now. 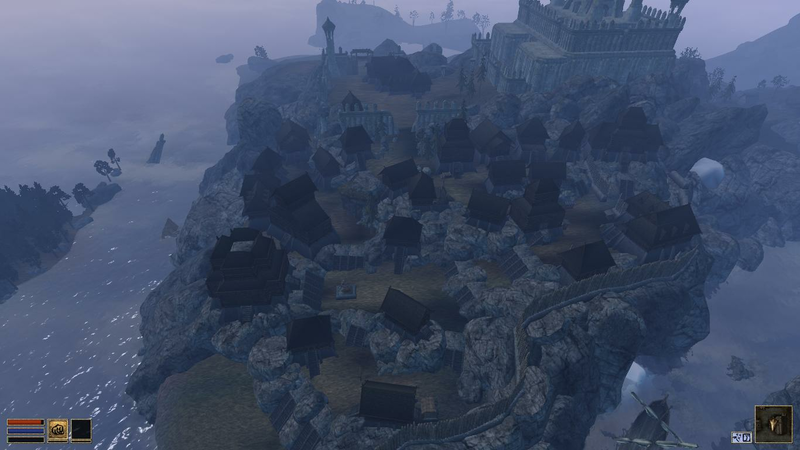 So to sum up if I understand your planning: the village docks, Elfstone Keep obviously and Imperial Quarter (with CoV) are the oldest parts of this town, right? With others being founded by new settlers not so far ago. Glad you like it, Berry. 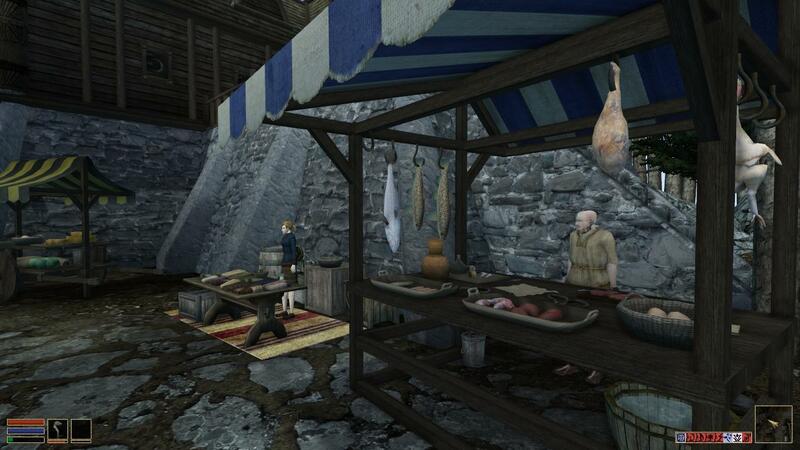 Actually I don't want to be nitpicky about exactly what districts appeared when, but the Imperial quarter and the college are somewhat recent additions in the city's history (400-500 years old), and the oldest part of the city is actually the market. When the Direnni were still farmers on Sumerset Isle and the Atmorans hadn't set sails yet, aboriginal natives gathered yearly for the summer market on the island. 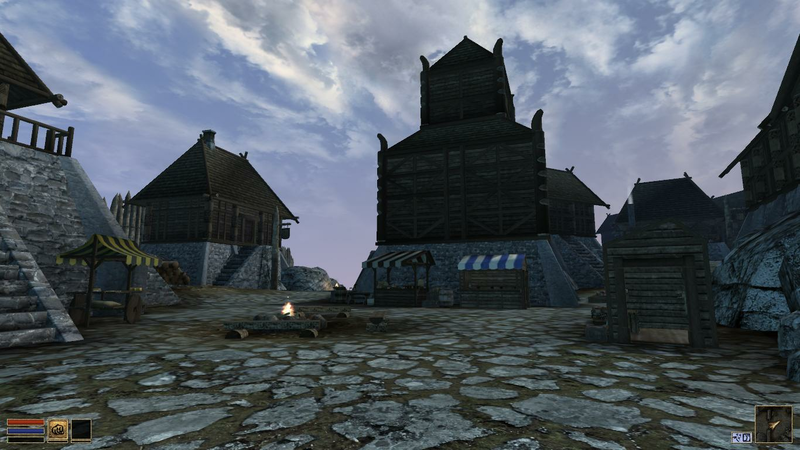 Here, the Falmer traded wares with the Nedes and proto-Reachmen that dwelled in the highlands and down the Karth which gave the city its name. 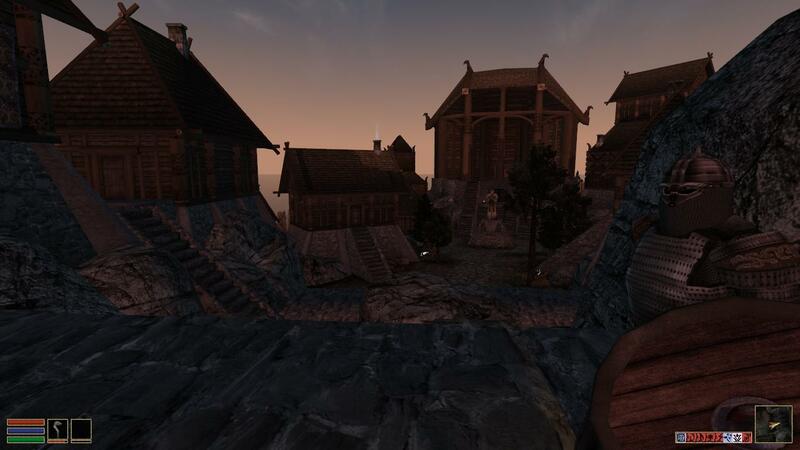 The proto-Reachmen and Nedes called the "city" or market Mercath (The Elves-on-Karth could be a translation), due to the elves they met here and traded with. 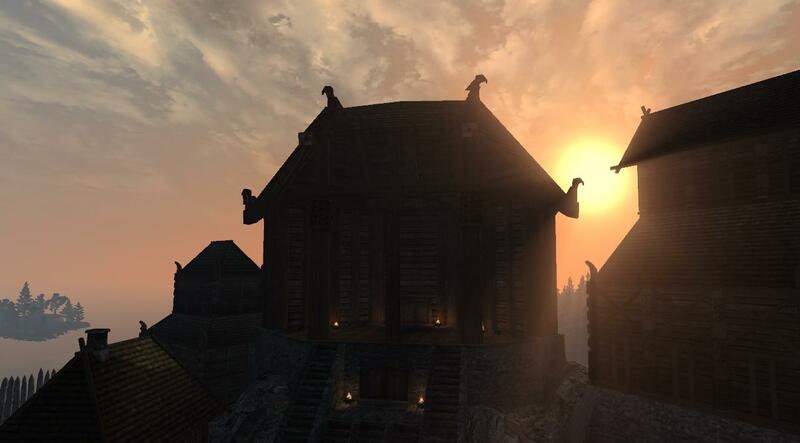 The name developed into the word market, which was adopted by the Nords and blended into the Aldmeri-Nordic hybrid that is modern Tamrielic. 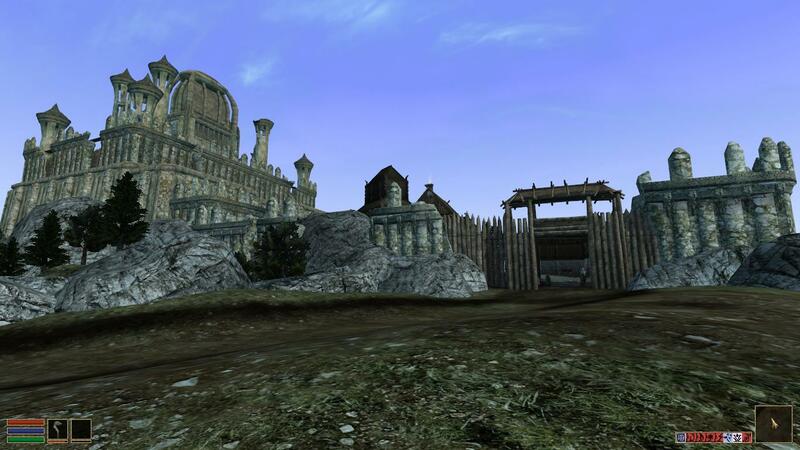 When the Falmer were driven back (or maybe before), the Direnni took control of the island which proved a valuable defensive spot against Atmoran attacks, as well as to control the trade taking place there. 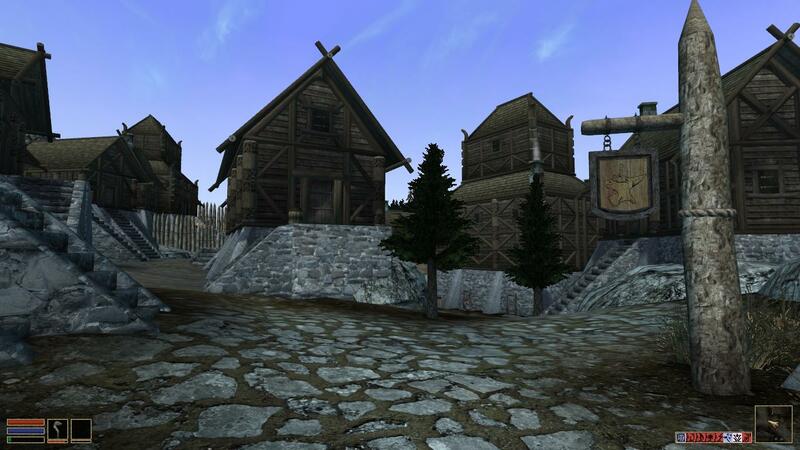 Eventually it was lost to the Nords, who took the keep and built (and expanded) the city that had been growing there, and after this a long history of Nordic kings ruled from here, and the city grew large. 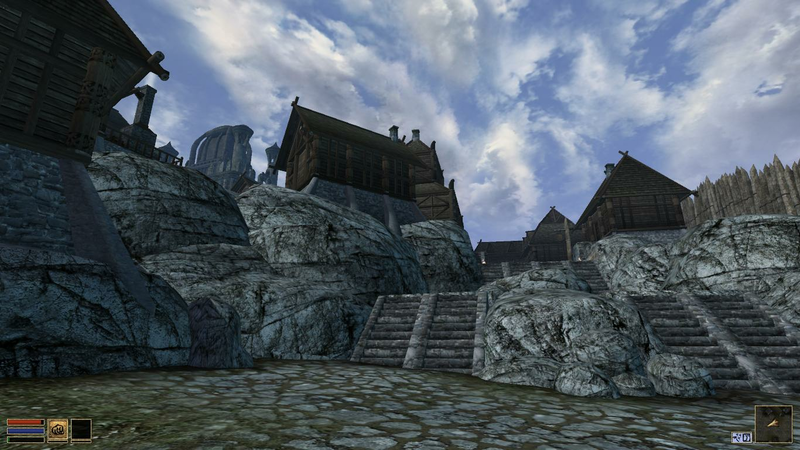 The college of the voice was built at the beginning of the third era, and the next centuries saw an influx of Imperial citizens to the city. 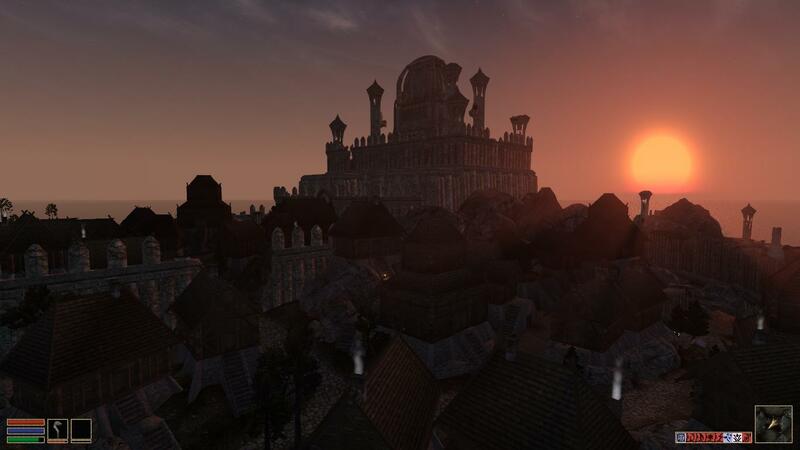 The city in its current size hasn't seen any major expansions since the loss of Karthwasten, where it was expanded a bit and got more fortified due to Nord refugees from the south and west. I'm not sure on this massive amount of imperial heraldry. 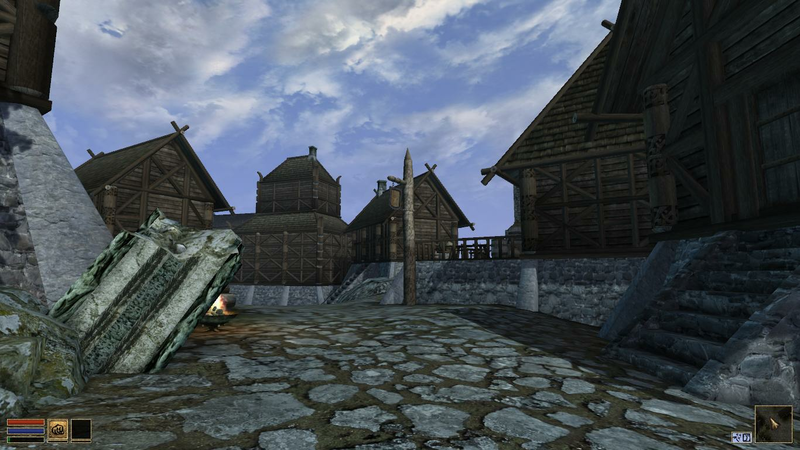 I feel it could make the whole city look like an imperial holding rather than mark an imperial quarter within an otherwise nord town. 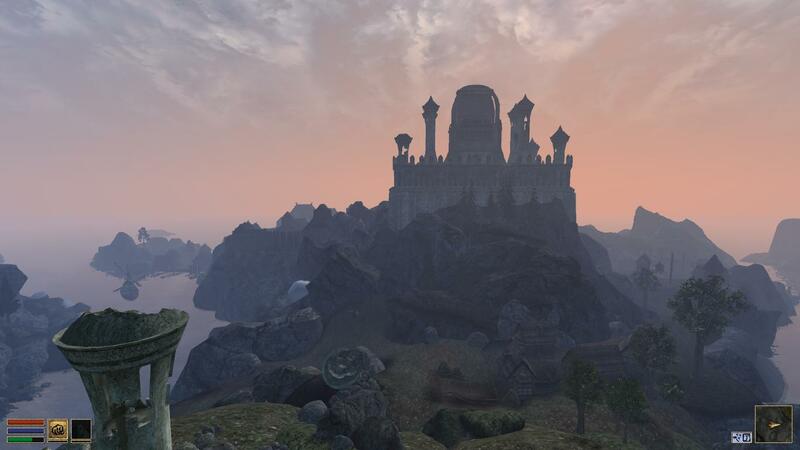 For the imperial cult shrine I would prefer to see a less old and withered building myself, maybe by using some elements taken from the imperial fort set. 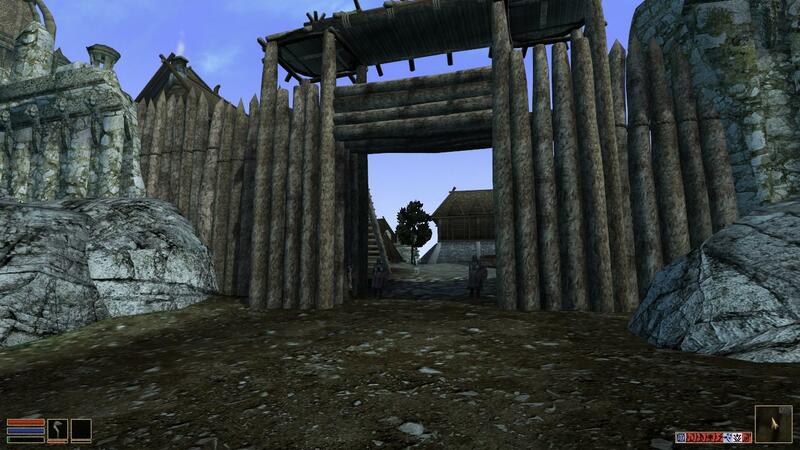 Right now it has more of an ancient barrow look and feel. 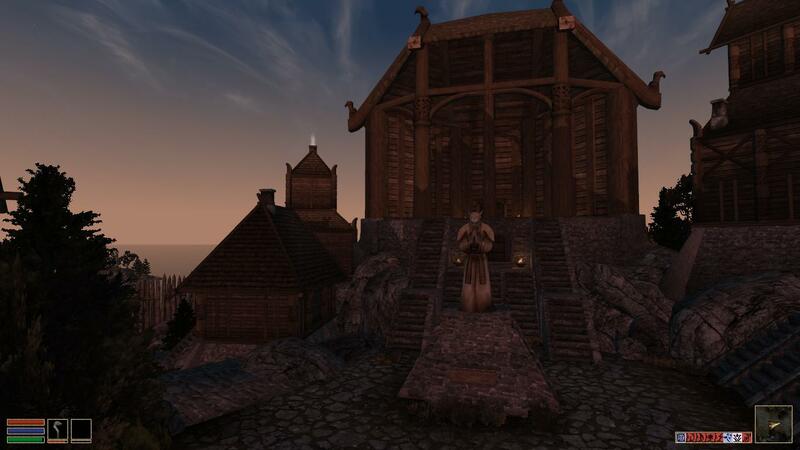 In response to Worsas's suggestions, I really like how the shrine looks as is, and feel the old withered look adds to the quarter's character. 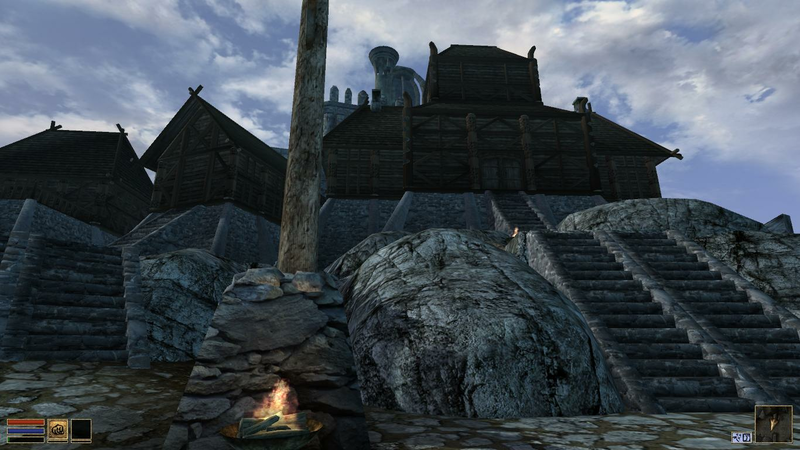 It doesn't look anything like a barrow to me, just a stone building that matches the Markarth and Direnni architecture sets aesthetically. I agree with Worsas that the amount of Imperial heraldry is a bit much. I'd only keep the shrine banners. We had some discussion on IRC about it. I think we agreed to keep the flags but make a ruby red texture without any Imperial heraldry on. roerich wrote: We had some discussion on IRC about it. I think we agreed to keep the flags but make a ruby red texture without any Imperial heraldry on. It's looking really great. You couldn't have placed it any better. Now that work on this is currenty halted, you should maybe upload your latest wip, only to have an online backup. 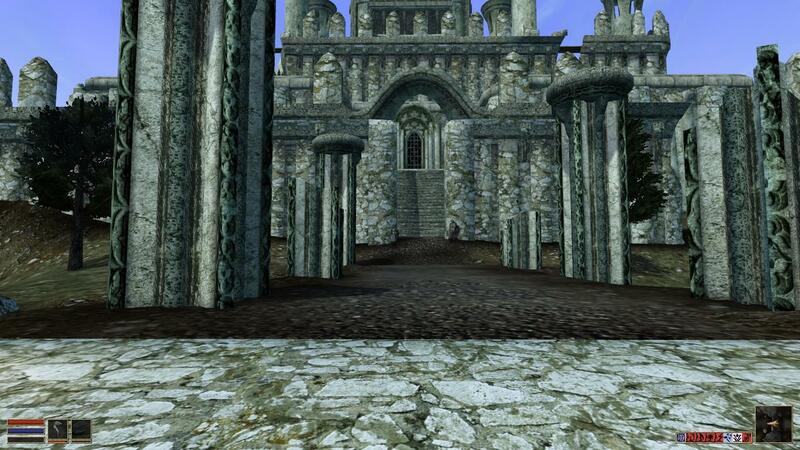 As his berryness has taken over work on Dragonstar, I have started work on Markarth again. I'll post an update soon, I promise! 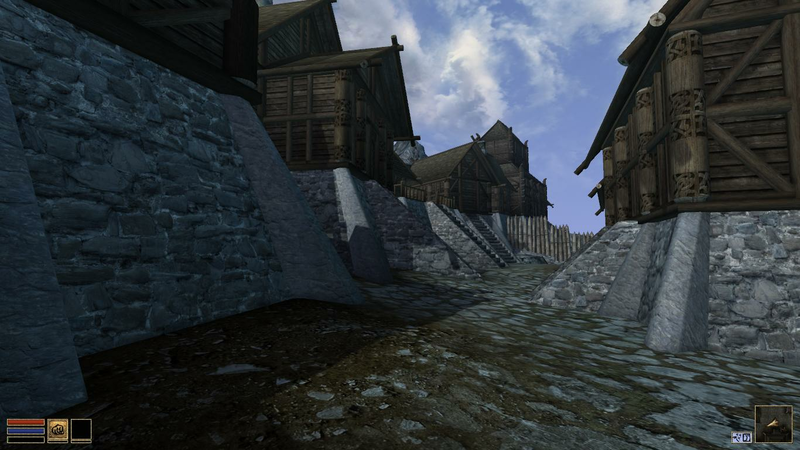 Reworked the south gate area. I'll make a winding road going upwards instead of a canyon and a bridge. 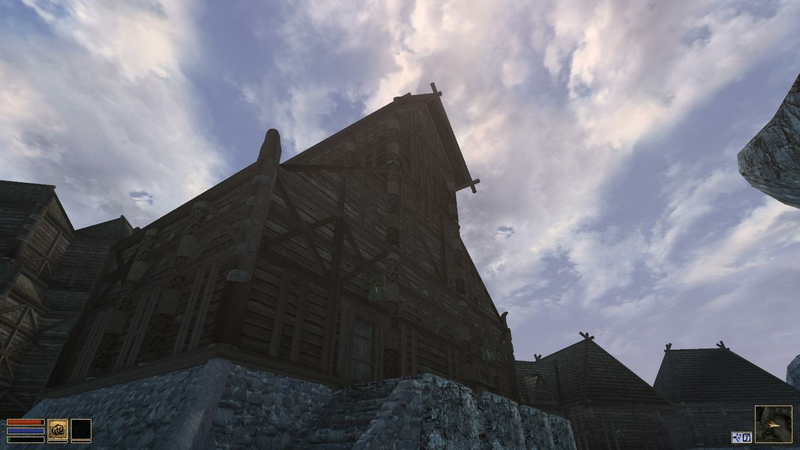 The stable has moved in behind city walls. 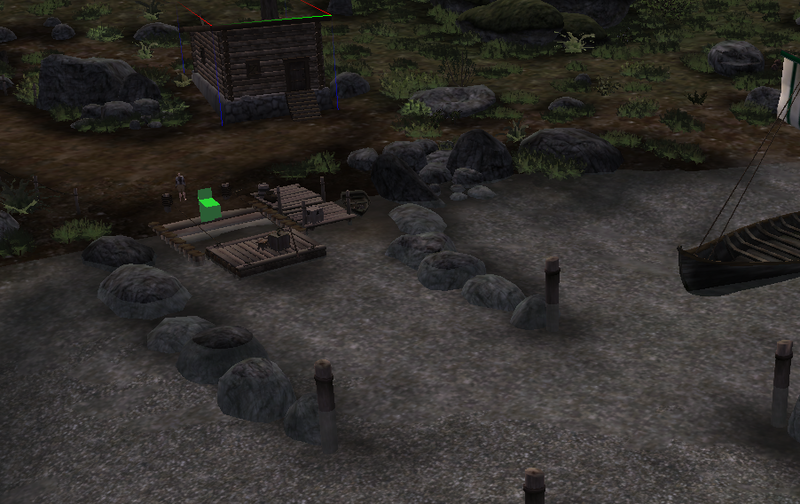 The city needs a lot of detailing, but the general placement of terrain, buildings and roads is finished. Love this city. It feels great to walk it's streets already. And to get lost on them too. A thought: have you considered going with some kind of a ford passage rather than a bridge in -102, 17? From what it looks like it could save you lots of work, and if I remember this area correctly from main exterior file, mainland terrain around here is rather flat, so it may be more fitting than sudden road elevation to the bridge. 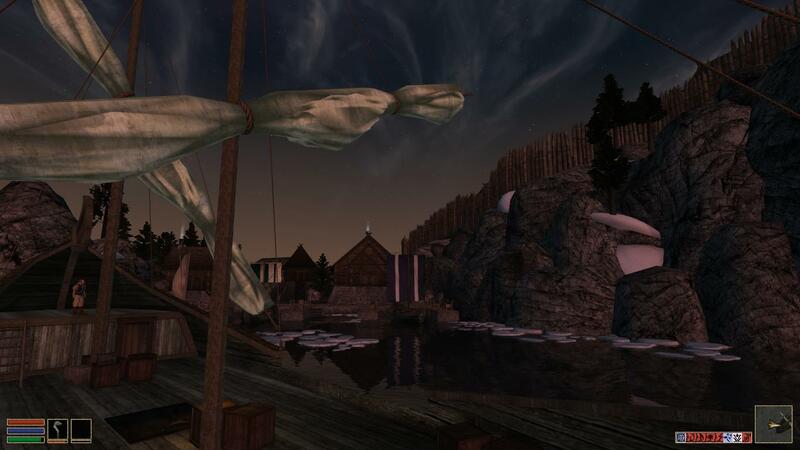 Nordic in-land boats are rather flat-bottomed, so they would be able to cross the shallows of the ford as well. Thanks berry, that was a terrific idea. Inspired me to work on this crossing with a raft ferry, allowing the player to cross the river without getting wet feet, as well as carrying carts, cattle and goods safely across. 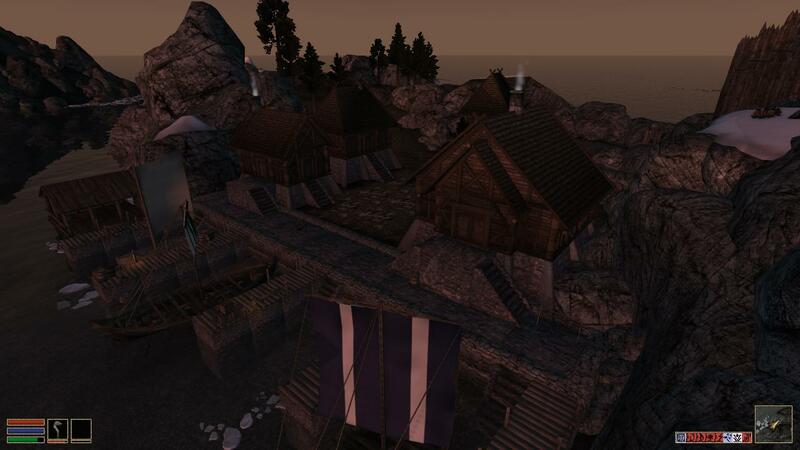 It has space for longships to pass by as well. Woah, that looks great. I guess afterall the line 'it will save you some work' didn't turn out true, given how many little details you put here. I'm glad that suggestion helped. If I remember correctly, we have another ferry passage further up the Karth, in Lestat's areas already, so this solution is good for continuity reasons as well. Ah, Bucklebury Ferry. Excellent. Can horses cross the river, though?